A great game by Bobby Wagner helped the Boise Hawks to their second straight win, a 5-4 decision over the Spokane Indians in a rare mid-week afternoon game at Memorial Stadium. The crowd of 500-600 fans (paid attendance was 1,300+) saw Wagner rope a two-run triple in the first, then club his fifth home run, a two-run shot in the fifth, to give the Hawks a 5-2 lead. They would need it, as a pair of errors in the eighth would allow the Indians to score a run, before Steve Grife slammed the door, getting the final five outs for his first save. BIG FOOTBALL GAMES: A couple big upsets in college football – Central Washington topped D-II #1 Minnesota-Duluth 13-10, while Villanova upset Temple (sorry Andy Simon) 31-24…Boise State was sloppy at times, but the defense was very impressive in the 19-8 win over Oregon – with an ultra-poor sportsmanship showing by the Ducks after the game. It was a whirlwind night for Spokane broadcaster Bob Castle, who hopped a plane to Spokane right after the game, in time to catch a charter to Abeliene, Texas, where he has to call the Whitworth-Hardin Simmons game on Saturday. LOOKING AHEAD: Trey McNutt, Dae-Eun Rhee, and Jon Nagel will be the rotation to close out the season – as the Hawks look to finish with a flurry. Finally with a computer with a solid connection – guess I had to make it to Caldwell to get one…as we struggled with internet issues the entire series in the Tri-Cities. A lot has gone down since then, so let’s look at what we have missed. SOME VIDEO – I was able to get a bit of video work done on the road, including a look at last Friday’s sellout crowd at Avista Stadium, along with a look at my hotel room at the Red Lion Columbia Center in Kennewick. NEW PLAYERS – I have been thoroughly impressed by the five new players that the Cubs promoted from Mesa, as the quintet has given the Hawks some life. The lefties – young Austin Kirk and Brooks Raley look like they have some potential, while Steve Grife and Dae-Eun Rhee have good stuff. I hope the fans in Boise will like the speed of Francisco Guzman – he is super fast. BALK, BALK, BALK – In Spokane, it got flat out ridiculous to everyone in the pressbox, both clubhouses, and even the fans how many balks were called in the final three games of the series, that I went and did some research. Through last Friday, there were 70 balks called in the Northwest League, spanning 268 games. The crew that handled the Hawks-Indians games, Javier Cantu and Ryan Goodman, had called 48 of the 70 balks – including every balk for Yakima this season, all but one of the balks for Tri-City and Salem-Keizer, and ten of the 11 Boise balks. Think about it 48 balks in 67 games for one crew, 22 balks in 201 games for the other three crews – seeing the same teams, same pitchers. 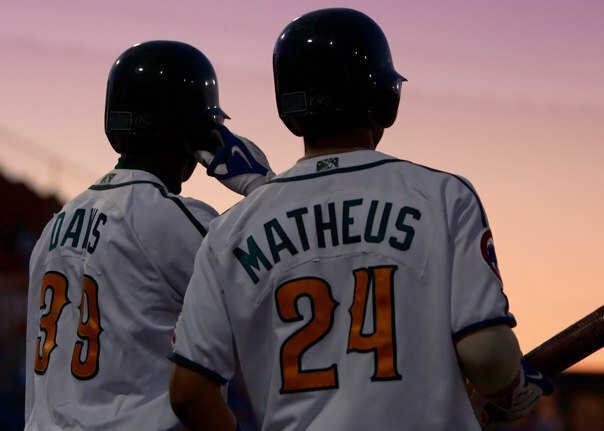 IT IS MATHEUS – It only took me 68 games to realize that we have been pronouncing George Matheus name incorrectly all year…at the Host Family Dinner at the start of the season, George introduced himself as George Muh-tay-us (or at least that is what we heard on the other side of the room)…however, it is George Matheus (like Mathews) – which we kidded about on Hawk Talk on Monday night (we will get the audio of the interview up shortly). WHAT A BOOK: Before we left for the trip, Dr. Jasper LiCalzi and I talked books on Business Baseball and Politics on Hawk Talk, and he recommended Clemente by David Maraniss – and loaned me the book for the road trip. I must say, what a great read about an amazing player. It was very engaging about his life on and off the diamond – and a sad way for him to die, hurriedly renting a broken plane for $4,000 to get aid to Nicaragua on New Years Eve, 1972. In fact, after reading it, our bus driver, Hal, took the book and read it as well – and he agreed, a great book about a great player. When I asked Tri-City radio man Mike Boyle about Clemente, who he saw play in the 1971 World Series against Baltimore, he said that he was one of the three best players he ever saw play in person (the others were Mike Schmidt and Jim Palmer). FOUL BALLS: This is one that blows me away – in my 30 years of being a baseball fan (the years I remember baseball), I have never caught a foul ball as a fan (I have gotten balls in the booth, but not as a fan). Well, between my wife Liza and son PJ (23 months old), they have five balls to their name this season – one in Yakima back in early August, then four more during the recent trip to Tri-City. One of the balls was signed by the complete 2009 Boise Hawks and will be added to the collection at our house – next to the 2003, 2004, and 2005 team balls (not sure why we don’t have them for the other years). 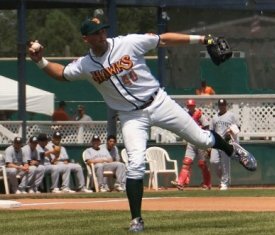 MEMORIAL STADIUM MAGIC, PART 6: Despite a rough season, the Hawks are a formidable foe at home, with a 19-14 record at Memorial Stadium after tonight’s 4-3 victory over Spokane, the sixth walk-off win this season. Runey Davis has a pair of winners – one in an 8-7 victory over Everett, and tonight’s gapper that scored Jae-Hoon Ha in the ninth.